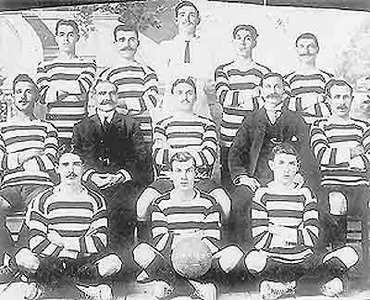 The only known photograph of St Joseph`s United, one of the original five members of the Maltese Football League in 1909-10. Back row: Caruana, Rizzo, Psaila, Caruana, J. Troisi. Centre: Vella, Bonello, Sammut, Ferrante, Azzopardi. Front: Briffa, Salvu Troisi, Wilfred Caruana. The origins of football in Msida stretch back to, at least, 1908. As far as we could ascertain the first team to be founded in the district was Msida United. This team played its maiden game on November 7, 1908 against the Lyceum FT, losing heavily by four goals to nil. Msida United continued to play the occasional game of friendly football up to March 1910 when they took part in the Junior Cup competition organised by the MFA. As luck would have it, Msida United were drawn against another team from Msida in the semi finals. St Joseph's United had just been founded when the two rivals met at Rinella Football Ground on March 10, 1910. Msida United won a hard-fought game 2-1. In the final however, Msida United lost 1-0 to Sliema United. In 1910, the National Football Ground was opened in Pietà. Huge crowds filled this venue, no matter which teams were playing. This prompted the owners of the ground to organise a cup competition between the best Maltese teams of the time. Msida United met Valletta United in the quarter-finals on April 9, 1910. Being primarily a youth team, the Msidians could not cope with the burly Valletta players and they were well and truly beaten by four goals to nil. This defeat spelt the end of Msida United. After this game, they disappeared completely from the local football scene. In the meantime, St Joseph's United were busy enhancing their reputation with some excellent displays of fast flowing football. The star of the team was undoubtedly Salvu Troisi who was destined to become one of the greatest Maltese footballers ever. The support of the people of Msida was diverted from Msida United to St Joseph's United. Therefore, it was the latter who went down in the history books as the first team to represent Msida in the Maltese Football League. In November 1909, the editor of the Daily Malta Chronicle offered a cup to the students of the Lyceum and University to be used for a cup competition. The offer was accepted but, later on, lack of participation forced the organisers to hold the competition in the form of a league. St Joseph's were one of the five founder members of the Civilian Football League. St Joseph's made their debut in the league on October 13, 1910 against the Boys Empire League. The Saints had a good start, winning an interesting game by three goals to two. Then, in their next match they had a walkover against the University FT. With four points under their belt, the team from Msida entered the ground for the game against Sliema Wanderers in defiant mood. Things however did not go as expected for them. When, midway through the second half, the Wanderers took a 2-1 lead, angry spectators invaded the pitch and the game was abandoned. Sliema were awarded the points and St Joseph's refused to honour their last fixture against Floriana. The next season, the league was not held and for the best part of the season St Joseph's were inactive. In 1911-12, the competition was held under the direction of the Malta Athletic Club but because of their reputation, St Joseph's United were not invited. Towards the end of the season however, the proprietors of the newly opened Mile End Sports Ground conceived a cup competition and this time, St Joseph's were admitted. St Joseph's were drawn against Senglea Shamrocks in the first round of the competition. Troisi opened the score for the team from Msida but Polidano equalised soon afterwards. In the second period the Saints took the initiative and were rewarded with another goal from Troisi. In the semi-finals, the Saints met the strong Valletta United. The Citizens were clear favourites to win this encounter but St Joseph's relieved the pundits of their money with a merited 1-0 victory. The final was held on March 31, 1912 at the Mile End. St Joseph's opponents were none other than the famous St George's FC. The Cospicuans had a formidable team in those days and St Joseph's were clearly out of their depth against such talented opponents. They resorted to kicking and rough play but this did not prevent St George's from winning by three goals to nil. After this game, St Joseph's United packed up their boots and they were never seen again at the Mile End.